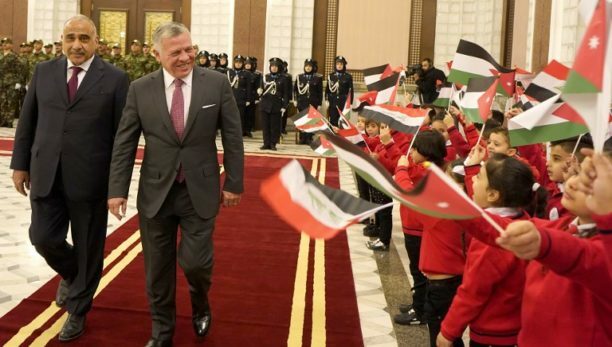 Jordanian King Abdullah II met Iraq’s president and prime minister in Baghdad on Monday, in the monarch’s first trip to Iraq in more than a decade. They said Jordan and Iraq were looking to strength bilateral ties but did not give additional details. Abdullah’s last trip to Iraq was in 2008, when he became the first Arab leader to visit Baghdad after strongman Saddam Hussein was toppled by the US-led invasion in 2003. In 2013, they agreed on a 1,700-kilometre pipeline linking Iraq’s oil-rich Basra province to Jordan’s Aqaba port, but the Islamic State group’s sweep across nearly a third of Iraq put a screeching halt to the plan. Last year, Jordan approved a framework to revive it, but did not give a timeframe for the line’s construction. The two states have also discussed plans for Iraq to import around 300 megawatts of electricity from Jordan to cope with widespread power shortages. Currently, Baghdad relies heavily on its eastern neighbour Iran, importing around 1,300 megawatts of electricity and 28 million cubic metres of natural gas to feed power plants. Washington, which sees Tehran as its top foe in the region, is keen to break those ties. It reimposed tough sanctions on Iran in November but has granted Iraq a temporary waiver on energy imports, while urging it to partner with US firms instead. “Everyone is looking to Iraq as a virgin land requiring more investment by regional and international powers,” said Iraqi political analyst Issam al-Faily. “Jordan has a real desire to stretch an oil pipeline from Basra to the Aqaba port because it would fulfil its fuel needs,” he told AFP. Iraq has witnessed a revolving door of diplomatic visits since Trump went in late December. US Secretary of State Mike Pompeo made a surprise stop in Baghdad on his regional tour last week, followed by Iran’s oil minister then top diplomat Mohammad Javad Zarif. Zarif landed Sunday and met with Abdel-Mahdi on Monday, according to the premier’s office. French Foreign Minister Jean-Yves Le Drian also met Abdel-Mahdi on Monday morning and said the two countries had entered “a new stage” in their ties. The premier said he appreciated France’s “support” to Iraq and hoped for greater economic cooperation. Fanar Haddad, an Iraq expert at the National University of Singapore’s Middle East Institute, said the flurry of visits showcased Iraq’s “major advantage”. “From Iran to the United States, Saudi Arabia to Turkey, Syria to Qatar, Iraq can speak to everyone in a region that is otherwise deeply fractured by several strategic fissures,” Haddad told AFP. But it also leaves Baghdad vulnerable to regional power struggles. “One of the most potent threats to Iraqi stability today is the danger of US-Iranian tensions escalating and playing out in, and at the expense of, Iraq,” said Haddad. That could thwart Iraq’s plans to rebuild after three gruelling years recapturing urban strongholds from IS. On Monday, two shepherds were found dead after being kidnapped by IS near Tikrit, around 175 kilometres north of Baghdad, according to police sources. It came a day after seven Iraqis were sentenced to death for “terrorism”-related charges.